What the damage to the Fukushima plant (see picture below) forecasts for Japan—and the world? But first, let us introduce general description of nuclear power stations in order to sense problems caused by the breakdown. Nuclear fission. Nowadays nuclear power stations generate energy using nuclear fission (Fukushima belongs to this type of nuclear power plants). Atoms of uranium (235) rods in the reactor are split in the process of fission and cause a chain reaction with other nuclei. During this process a large amount of energy is released. The energy heats water to create steam, which rotates a turbine together with a generator, producing electricity. 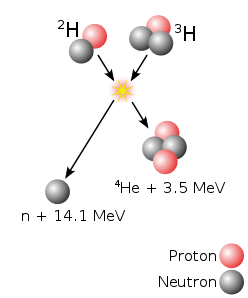 Depending on the type of fission, presumptions for ensuring supply of the fuel at existing level varies from several decades for the Uranium-235 to thousands of years for uranium-238. At the present rate of use, uranium-235 reserves (as of 2007) will be exhausted in about 70 years. The nuclear industry persuades that the cost of fuel makes a minor cost component for fission power. In future, mining of uranium sources could be more expensive, more difficult. However, increasing the price of uranium would have little brought about the overall cost of nuclear power. For instance, a doubling in the cost of natural uranium would increase the total cost of nuclear power by 5 percent. On the other hand, double increasing of natural gas price results in 60 percent growth of the cost of gas-fired power. The possibility of nuclear meltdowns and other reactor accidents, such as the Three Mile Island accident and the Chernobyl disaster, have caused much public concern. Nevertheless, coal and hydro- power stations have both accompanied by more deaths per energy unit produced than nuclear power generation. At present, nuclear energy is in decline, according to a 2007 World Nuclear Industry Status Report presented in the European Parliament. The report outlines that the share of nuclear energy in power production decreased in 21 out of 31 countries, with five fewer functioning nuclear reactors than five years ago. Currently 32 nuclear power plants are under construction or in the pipeline, 20 fewer than at the end of the 1990s. Fusion. 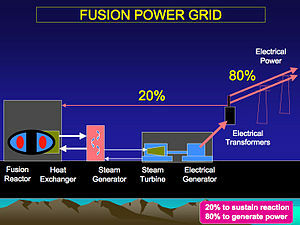 Fusion power could solve many of fission power problems. Nevertheless, despite research started in the 1950s, no commercial fusion reactor is expected before 2050. Many technical problems remain unsolved. Proposed fusion reactors commonly use deuterium and lithium as fuel. Under assumption that a fusion energy output will be kept in the future, then the known lithium reserves would endure 3000 years, lithium from sea water would endure 60 million years. A more complicated fusion process using only deuterium from sea water would have fuel for 150 billion years. Due to a joint effort of the European Union (EU), America, China, India, Japan, Russia and South Korea a prototype reactor is being constructed on a site in Cadarache (in France). It is supposed to be put into operation by 2018. Initial projections in 2006 put its price at €10 billion ($13 billion): €5 billion to build and another €5 billion to run and decommission the thing. Since then construction costs alone have tripled. As the host, the EU is committed to covering 45% of these, with the other partners contributing about 9% each. In May 2010 the European Commission asked member states to conduce an additional €1.4 billion to cope with the project over to 2013. Member states rejected the request. Sustainability: The environmental movement emphasizes sustainability of energy use and development. “Sustainability” also refers to the ability of the environment to cope with waste products, especially air pollution. The long-term radioactive waste storage problems of nuclear power have not been fully solved till now. Several countries use underground repositories. Needless to add nuclear waste takes up little space compared to wastes from the chemical industry which remains toxic indefinitely. Future of nuclear industry. Let us return to how the damage to the Fukushima plant affects future usage of nuclear power in the future in Japan – and in the world. Nowadays nuclear plants provide about a third of Japan’s electricity (see chart), Fukushima is not the first to be paralysed by an earthquake. But it is the first to be stricken by the technology dependence on a supply of water for cooling. The 40-year-old reactors in Fukushima run by the Tokyo Electric Power Company faced a disaster beyond anything their designers were required to imagine. However, the region where nuclear power should grow fastest, and seems to be deterred, is the rest of Asia. Two-thirds of the 62 plants under construction in the world are in Asia. Russia plans another ten. By far the most important arising nuclear power is China, which has 13 working reactors and 27 more on the way. China has announced a pause in nuclear commissioning, and a review. But its leaders know that they must go away from coal: the damage to health from a year of Chinese coal-burning plants is bigger then from nuclear industry. And if anyone can build cheap nuclear plants, it is probably the Chinese. In case the West turns its back on nuclear power and China holds on, the results could be unfortunate. Nuclear plants need trustworthy and transparent regulation. Here is my general impression after 4 days of owning this device. the 2 GB SD (Security Digital) card is included, but it is possible to use 16 GB SD card (internal memory 384 MB); notice: Secure Digital (SD) is a non-volatile memory card format developed by Panasonic, SanDisk, and Toshiba for portable devices. besides reading and listening to the books it also provides listening to the music or showing pictures. not all paper books (especially by Czech authors) are in a form of e-book. in the future, when more sophisticated functions are amended, it will bring great conveniences for common people. NOTE: E-Ink is used with electronic paper (e-paper) or electronic ink display, which imitates the appearance of ordinary ink on paper. E-paper reflects ambient light like ordinary paper rather than emitting its own light. An e-paper display can be read in direct sunlight without the image appearing to fade. Moreover, in this case the contrast seems to be the best. On the contrary, in the places that are not well lit the problem with contrast could appear. Through this new technology the display takes the energy from a battery only when it draws its content. It lasts just a fraction of a second. For the rest of displaying time no feed power is needed. 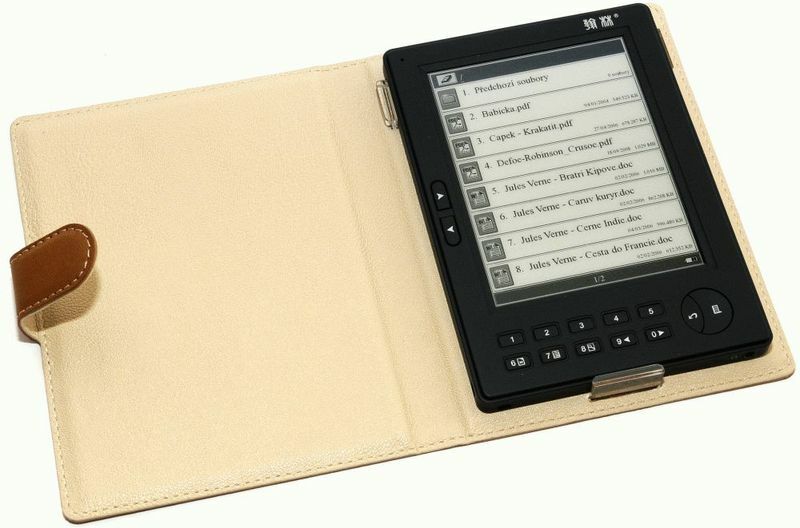 This feature let the e-Reader offer hundreds hours of reading without charging, e.g. with standard Li-pol accumulator it makes about 8000 pages of text. E-Reader can show videos or photos but the quality of showing them is not good. But first of all, renewables are very expensive. 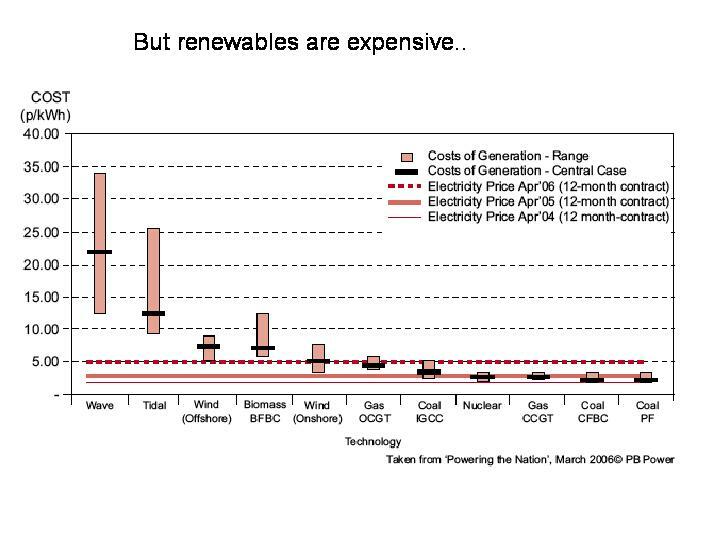 Relative costs of generating electricity from different sources, which are shown on the next graph, support it with evidence. Capital costs (including waste disposal and decommissioning costs, especially for nuclear power plants – NPPs) – tend to be low for fossil fuel power stations; high for renewables and nuclear power plants; very high for waste to energy, wave and tidal, photovoltaic (PV) and solar thermal power installations. Operating and maintenance costs – tend to be high for nuclear, coal, and waste-to-energy power stations (fly and bottom ash disposal, emissions clean up, operating steam generators) and low for renewables and oil and gas fired peaking units. Fuel costs – high for fossil fuel and biomass sources, very low for nuclear and renewables, possibly negative for waste to energy power plants. Expected annual hours run – as low as 3% for diesel peakers, 30% for wind, and up to 90% for nuclear power stations. Comparative costs of electricity produced by different source of primary energy and calculated, using the above mentioned factors, are depicted in Fig.2. 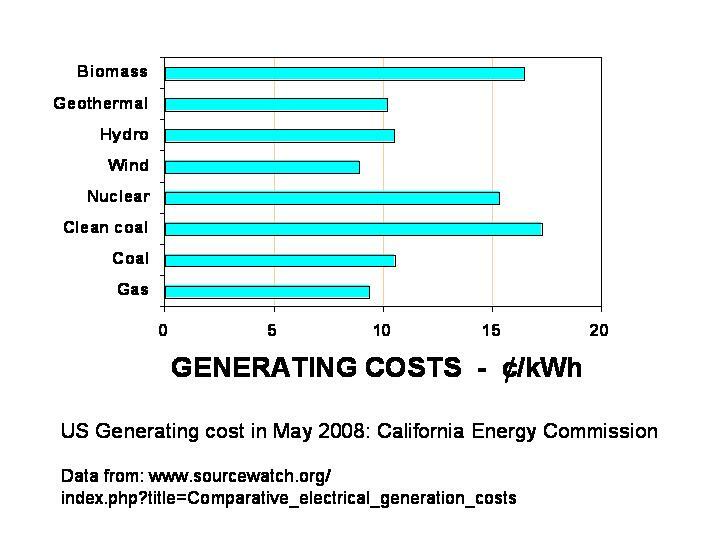 USA Generating costs in May 2008 given in Fig. 3 also support this fact. 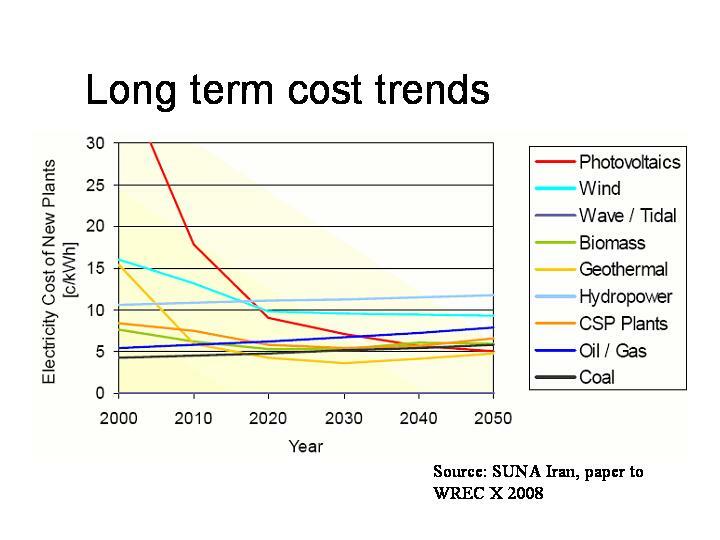 Nonetheless, in long term context the costs should equal according to different forecasts – see, for example Fig. 4. Besides high costs the other serious problem connected with renewables concerns their intermittence. It means that a wind power installation generate electricity when wind blows and similarly a solar plant produces electricity when the Sun shines. But consumers require and consume electricity when they need it, e.g. in the mornings, evenings i.e. mostly at the time quit different from the time when wind blows or the Sun shines. So, means for energy balancing, which is limited, in order to meet consumers´ demands (see a detailed analysis of the issue in Renewable energy – our downfall? by Ralph Ellis and in posts If we don´t interest in the energy future, we may see its collapse and Is the „green“ energy really free?). Nowadays, some gas power plants or hydro power plants are used to balance the variation … With more intermittent renewables in the electricity grid they will have to do this much more often and situation could become intricate, maybe unsolvable. The problem is not lack of wind or solar (etc.) energy, it is a fact that at times there may be too much wind or sun. Different operational and economic conflicts will arise, especially at time of low electricity demands. Energy storage (e.g. pumped hydro) and export through new inter-connections could help (for teach-in how serious the situation is see Renewable energy – our downfall?). I have just received e-mail with information you see below. I think it is worth being known. For this reason I am putting the information at this blog. Maybe it helps somebody to make right decision. Enjoy reading the information. – DirectX 9 graphics processor with WDDM 1.0 or later driver. So the map serves as a central access-point to current renewable energy information, which is very comfortable. Moreover, you will find unknown for you concepts in the glossary accessed from the map. REN21 has already ensured authentic information for several years, in particular through its Renewables Global Status Report. A new tool, the Renewables Interactive Map is intended to trail more closely the dynamic development of renewable energy production and market development. Furthermore, it provides disaggregated information for particular countries and technologies (see aggregated information on the topic at this blog too, About renewables position just now ). Studying renewable energy information you improve your technical English, enjoying competent technical texts. Moreover, at the same time you gain very advantageous and comprehensive information about things which we all depend on. Fuel ethanol (production in thousand tonnes oil equivalent). Study the statistics of worldwide renewables adopted from http://www.bp.com/liveassets/bp_internet/globalbp/globalbp_uk_english/reports_and_publications/statistical_energy_review_2008/STAGING/local_assets/2009_downloads/renewables_section_2009.pdf. Notice the column „Change 08 over 07“. 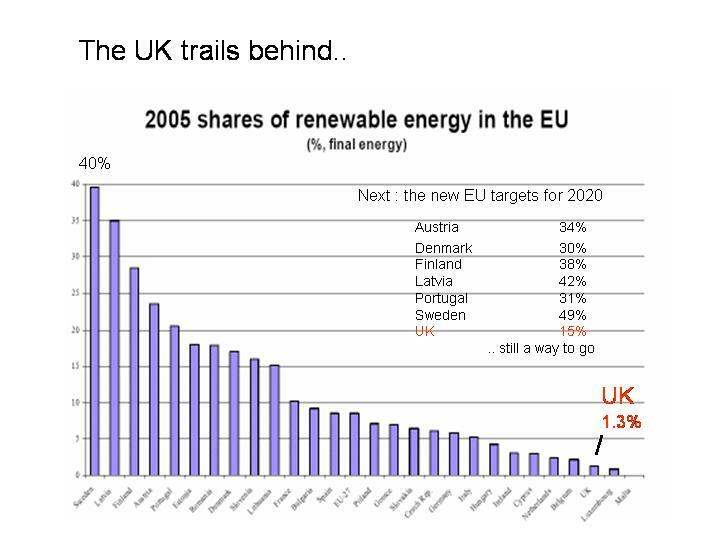 It demonstrates that in 2008 capacity of renewables installations is increase in comparison with 2007. For example, production of ethanol in the USA increased by 42.0 % and makes 52.2 % world production of ethanol. In Europe the production increased by 50.8, but makes only 3.8 % world production of this biofuel. Statistics about usage of solar energy usage in Europe are of particular interest. For example, total increase of cumulative installed photovoltaic (PV) power counts up to 69.1 %, where Germany increased its solar installed PV power by 37.5 %(40,9 % of world total) and Spain had the growth of its solar installed PV power by 422.2 % (24.5 % of world total). REN21 (Renewable Energy Policy Network for the 21st Century) is a global policy network that provides a forum for international leadership on renewable energy. Its goal is to encourage the policy of development and the rapid expansion of renewable energies in developing and industrialised economies. multi-touch computing technology enables to communicate with a computer using all 10 fingers, not only touching the screen by one finger. Perhaps most fundamental was exploiting an optical effect known as frustrated total internal reflection (FTIR), which is also used in fingerprint-recognition equipment. Attempts and efforts made by Microsoft, Mitsubishi Wired In and other large, well-known companies are routed to find out the best solution and results of their work are astounding. My advice – read the post and enjoy it! Handwriting recognition concerns the ability of a computer to get and interpret comprehensible handwritten input from paper documents, photographs, touch-screens and other devices. Two varieties of hhandwriting recognition are principally distinguished: off-line and on-line. The image of the written text may be estimated “off line” from a piece of paper by optical scanning through OCR (optical character recognition) or by IWR (intelligent word recognition). As contrasted to “off-line handwriting recognition”, under “on line handwriting recognition” a real-time digitizing tablet is used for input, for example, by a pen-based computer screen surface. Off-line handwriting recognition involves the automatic conversion of text into letter codes, which are usable within computer and text-processing applications. The data obtained by this form is regarded as a static representation of handwriting. The technology is successfully used by businesses which process lots of handwritten documents, like insurance companies. The quality of recognition can be substantially increased by structuring the document, for example, by using forms. The off-line handwriting recognition is relatively difficult because people have different handwriting styles. Nevertheless, limiting the range of input can allow recognition to be improved. For example, the ZIP code digits are generally read by computer to sort the incoming mail. In optical character recognition (OCR) typewritten or printed text (usually captured by a scanner) is mechanically or electronically conversed into machine-editable text. When one scans a paper page into a computer, the process results in just an image file a photo of the page. Then OCR software converts it into a text or word processor file. Intelligent Word Recognition, or IWR, is the recognition of unconstrained handwritten words. IWR recognizes entire handwritten words or phrases instead of character-by-character, like OCR. IWR technology matches handwritten or printed words to a user-defined dictionary, It leads to significantly reducing character errors encountered in typical character-based recognition engines. IWR also eliminates a large percentage of the manual data entry of handwritten documents that, in the past, could be detected only by a human. New technology on the market utilizes IWR, OCR, and ICR (intelligent character recognition, i.e. an advanced optical character recognition) together. For example, most ICR software has a self-learning system referred to as a neural network, which automatically updates the recognition database for new handwriting patterns. All these achievements open many possibilities for the processing of documents, either constrained (hand printed or machine printed) or unconstrained (freeform cursive). Moreover, a complete handwriting recognition system, as a rule, also handles formatting, performs correct segmentation into characters and finds the most plausible words. On-line handwriting recognition involves the automatic conversion of text as it is written on a special digitizer or a personal digital assistant (PDA), which is a mobile device, also known as a palmtop computer. PDA sensor picks up the pen-tip movements as well as pen-up/pen-down switching. The obtained signal is converted into letter codes which are usable within computer and text-processing applications. A pen or stylus for the user to write with. A touch sensitive surface, which may be integrated with, or adjacent to, an output display. A software application which interprets the movements of the stylus across the writing surface, translating the resulting strokes into digital text. Commercial products incorporating handwriting recognition as a replacement for keyboard input were introduced in the early 1980s. Since then advancements in electronics have allowed the computing power necessary for handwriting recognition to fit into a smaller form factor than tablet computers, and handwriting recognition is often used as an input method for hand-held PDAs. Modern handwriting recognition systems are often based on Time Delayed Neural Network (TDNN) classifier, nicknamed “Inferno”, built at Microsoft. In recent years, several attempts were made to produce ink pens that include digital elements, such that a person could write on paper, and have the resulting text stored digitally. 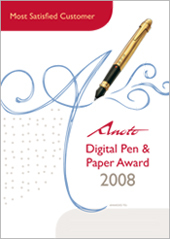 The best known of these use technology developed by Anoto (see also Discussion – The Digital Pen), which has had some success in the education market. The general success of these products is yet to be determined. Nevertheless, a number of companies develop software for digital pens based on Anoto technology. According to Mountain View, CA, December 1, 2009 – PhatWare Corporation announces the launch of the latest version of PenOffice (PenOffice 3.3), which works with Microsoft Windows 7 and Microsoft Windows Server 2008 R2. PhatWare Corporation is a leading provider of software products and professional services for mobile and desktop computers. Its new product offers customers enhanced security and innovative user interface features. PenOffice 3.3 is an advanced pen-enabled collaboration and handwriting recognition software for Microsoft Windows-based computers. It can be used with any pointing input device, such as graphic tablet, interactive while board, touch screen monitor, Tablet PC, online digital pen, and even standard computer mouse. Although handwriting recognition is an input form that the public has become accustomed to, it has not achieved widespread use in either desktop computers or laptops. It is still generally accepted that keyboard input is both faster and more reliable. As of 2006many PDAs offer handwriting input, sometimes even accepting natural cursive handwriting, but accuracy is still a problem, and some people still find even a simple on-screen keyboard more efficient. Already in 2007 Windows 7 were said to have new touch features. An overview of the multi-touch capabilities, including a virtual piano program, a mapping and directions program and a touch-aware version of Paint, was demonstrated at the All Things Digital Conference on May 27, 2008. A video demonstrating the multi-touch capabilities was later made available on the web. Let us specify some necessary term. A touchscreen is a display that can detect the presence and location of a touch by a finger or hand within the display area. The touchscreen has two main properties. First, it enables one to interact with what is displayed directly on the screen. Second, it lets one do so without requiring any intermediate device, again, like a stylus, for instance. Such displays can be attached to computers or, as terminals, to networks. They also play a prominent role in the design of digital appliances such as the personal digital assistant (PDA), satellite navigation devices, mobile phones, and video games. Multi-Touch, which is a trademark of Apple, Inc., concerns the same technology that allows the user to interact with the device by placing two or more fingers directly onto the surface of the screen. The movement of the fingers across the screen creates gestures, which send commands to the device. Gesture recognition is topically used in computer science and language technology for goal interpreting human gestures via mathematical algorithms. Gestures can originate from any bodily motion or state but commonly originate from the face or hand. Current focuses in the field include emotion recognition from the face and hand gesture recognition. The gesture recognition can be seen as a way for computers to begin to understand human body language. Thus it may build a more sophisticated connection between machines and humans than primitive text user interfaces or even GUIs (graphical user interfaces), which still embraces the majority of input to keyboard and mouse. However, the gesture recognition enables humans to interface with the machine (HMI) and interact naturally without any mechanical devices. Using the concept of gesture recognition, it is possible to point a finger at the computer screen so that the cursor will move accordingly. This could potentially make conventional input devices such as mouse, keyboards and even touch-screens redundant. Finally, gesture recognition can be conducted with techniques from computer vision and image processing. In general, multi-touch requires a touch screen (screen, overlay, table, wall, etc.) or touchpad, as well as software that recognizes multiple simultaneous touch points, as opposed to the single touch screen, which recognizes only one touch point. This effect is achieved through a variety of means, including heat, finger pressure, high capture rate cameras, infrared light, optic capture, tuned electromagnetic induction, ultrasonic receivers, transducer microphones, laser rangefinders, and shadow capture. Although the first hints and discussions of multi-touch technology appeared already at the end of 20th century, mainstream exposure to this technology occurred in 2007, when Apple unveiled the iPhone and Microsoft debuted surface computing. The iPhone in particular has spawned a wave of interest in multi-touch computing because it permits greatly increased user interaction on a small scale. Gradually more robust and user-friendly multi-touch and gesture-based solutions have been becoming available. Windows 7 is the first version of Windows that supports multi-touch without the addition of third party add-ons. (See for more details Multi-Touch Systems that I Have Known and Loved by Bill Buxton). The operating system is known to have a multi-touch mapping application, photo viewing program, and incorporation in Internet Explorer 8. In January 2009, Microsoft joined with other investors who invested twenty-four million dollars in N-Trig Ltd., which plans to make computer hardware that takes advantage of Windows 7’s multi-touch support. In the end let´s put some notes on a touch-aware version of Paint (formerly Paintbrush for Windows). It is a simple graphics painting program that has been included with all versions of Microsoft Windows. It is often referred to as MS Paint or Microsoft Paint. The program opens and saves files as Windows bitmap with the .bmp extension, JPEG, GIF (without animation), PNG (without alpha channel), and TIFF (without the multiple pages). The program can be in colour mode or two-colour black-and-white, but there is no grayscale mode. For its simplicity, it rapidly became one of the most used applications in the early versions of Windows and still has strong associations with the immediate usability of the old Windows workspace. The Windows 7 version of paint makes use of the Ribbon UI (User Inteface). In GUI-based application software, a ribbon is an interface where a set of toolbars are placed on tabs in a tab bar. Recent releases of some Microsoft applications have comprised this form with an tricky modular ribbon as their main interface. The Ribbon can also contain tabs to expose different sets of control elements eliminating the need for a lot of different icon based toolbars. It similarly provides “artistic” brushes composed of varying shades of gray and some transparency that give a more realistic result. In order to increase feeling of the realism, the oil and water colour brushes can only paint for a small distance before the user must re-click. This gives the illusion that the paint brush has run out of paint. It l has anti-aliased shapes as well, which can be resized freely until they are rasterised when another tool is selected. This version supports viewing (but not saving) transparent PNG and ICO file formats and saves in the PNG file format by default.